The LDDP-2000 is a highly flexible microprocessor based large digit process display with a standard scaleable display range of - 9999 to + 99999. 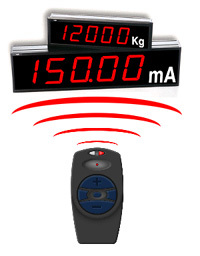 The display is programmable for a wide variety of industry standard inputs, from an infra red (IR) hand held programmer (Model LDDPH, see ordering information). Only one IR programmer is required to programme as many displays (individually) as is required in any application anywhere on a plant. The LDDP-2000 is suitable for any application where data needs to be viewed from a distance, from the murky environments of heavy processing industries to clean room Laboratory applications. The display's are housed in rugged aluminium enclosures to IP55 / NEMA 12 protection and complete with the hardware for mounting. All wiring connections and input type selection are made via terminals and DIP switches on the rear of the enclosure. This feature allows easy ON SITE programming of the display with an easy to use 6 button IR programmer. One programmer is all that is required to re-programme or re-scale the input type on a host of displays anywhere on the plant without major disruption to production. NOTE: - The LDDPH is required for all 4 sizes of display. The LDDP-200 is programmable for use with Serial Communications RS-232 or RS-485, it is also programmable for communicating the data by Sending, Broadcasting or Receiving. Each display is supplied with (two) sample programs for running on a PC. This allows a fast means of checking the operation of a display system. Application-specific software can be developed by Eagle Controls at very reasonable cost.